The Gloucester Report's commission was aware of the existence of clubs and pubs used 'as meeting places by the homosexual community' [Gloucester Report (sec17) (1979) 10]. It is possible that the working party had in mind some of the few 'gay-friendly' venues which opened in Soho in the decade preceding their report. Today the picture has changed dramatically. Soho has practically ceased to be London's red light quarter and has become the heart of the Capital's LGBT community. However, one feature of this area has remained the same for decades; Soho is a place where people enter 'a kind of darkness in which they seem to be lost' [Kenneth Leech (2009) 193]. These shadows might be represented by homelessness and drug abuse, whilst episodes of 'queer-bashing' [Gloucester Report (sec14) (1979) 9] and hate-crimes are other examples of the 'darkness' which recurrently threatens the LGBT community. Fr Leech is not entirely negative about his statement and he envisages wholesome transformation and growth whenever individuals are challenged to face these problems. The wider Church has often been successful in bringing light and relief in Soho; for example in 1968 Fr Leech founded the homeless youth charity Centrepoint in the basement of St Anne's. The gay community naturally turned towards Soho parish church in the aftermath of tragedies which shocked the many individuals. For instance, the Rector offered prayers and led a service of remembrance after a nail-bomb exploded in the Admiral Duncan public house killing and injuring several people. Similarly, more than a thousand people attended another vigil which took place in the church gardens in 2005 to remember Mr David Morley the bar manager of the Admiral Duncan – and a survivor of the 1999 attack – who was murdered on the South Bank in a homophobic attack. These 'crisis ministries' have been important opportunities for a congregation to open its doors to those prisoners of grief and for the clergy to truly stand in persona Christi and 'bind up the broken-hearted' (Isa 61:1). St Anne, Soho is a continuous presence at the heart of Soho: it celebrates the diversity of the LGBT community, it invites people to acknowledge Christ and it offers comfort to those in distress. 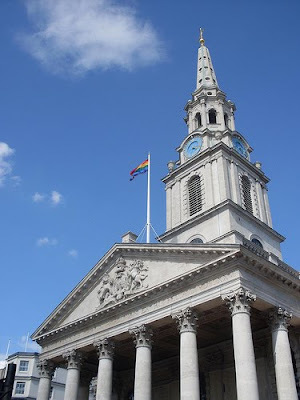 Other churches and Christian groups in this area, such as Soho Masses, St Patrick Soho Square, St James' Piccadilly and St Martin-in-the-Fields seek to witness to the Gospel in engaging positively with the gay community. Many thousands of visitors walk through the doors of St Martin in-the-Fields every year for different reasons. On one hand, tourists might be attracted by the prominence of the building over Trafalgar Square; the homeless on the other hand are sure to find help and food there every day of the year. However, St Martin's ministry reaches out to the LGBT community as well. The church might not be as famous as other ones in London for this type of pastoral work, but many homosexual men and women have found comfort in the church's welcoming approach which more than others reflects the spirit of dialogue envisaged by Resolution 1.10 of Lambeth 1998. St Martin's congregation is committed in recognising and celebrating the ministry of gay people and in engaging in a dialogue with those of different opinion in a nonjudgmental way. For the past few years however, the Rainbow Flag was flow from the church top on occasion of Pride London making St Martin's a welcoming place and a source of healing for those who previously felt rejected by religion. Whilst the two church communities taken in consideration so far are involved practical ministry, St Martin's focuses its attention on listening to individual stories and helping each person to discover for themselves the significance of Jesus Christ [cf. Fr Richard Carter, Assistant Priest, St Martin-in-the-Fields (Aug 2009)] in their lives. St Luke's, Charlton: 'There is a single group of people who desperately need an ideal and role model to exemplify [faithful relationships]; is it is gay people' [Jeffrey John (2000) 46]. In 1979 – the same year of the Gloucester Report about homosexual relationships – a relatively small congregation in Charlton (Diocese of Southwark) featured on the pages of tabloids and broadsheets as 'the church that marries gays' [Jeffrey Heskins (2001) 1]. Since then St Luke's has continued to support and bless couples that entered in faithful relationships. St Luke's was neither the host of a particularly practical project for those at the margins of the community like the previous parishes nor was it rooted in the unordinary settings of Central London. Besides the church was described by one of its Vicars as 'an ancient parish church in an ordinary urban setting with little to suggest that [was] either odd or extreme' [Ibid. 2]. The congregation might have held fairly progressive views on social justice and other issues concerning the wider Church; however St Luke's decision to bless a same gender couple was the simple answer to the pastoral need of two men who were already actively involved in the church community. The Vicar responded to Saxon and Rodney's desire to feel fully accepted and consequently the congregation seemed on the whole prepared to make room for them as a couple and celebrate their nineteen-years-long union. Evangelical communities in the area have expressed their concerns in various ways [cf. Ibid. 5] since then, demonstrating how a single parish's decision could 'rock the boat' of the surrounding area. However, the PCC and the Vicar – supported by the congregation – persevered in holding subsequent similar services of blessing and refused to conduct them behind closed doors. Remarkably, there is no mention of this matter in biography of Mervyn Stockwood who was Bishop of Southwark at that time. Conversely, it was only after 1988 that the new Team Vicar Fr Heskins decided to explore the congregation's feeling about the blessing of same homosexual couples more in depth. The fruits of this work have been published in Unheard Voices and they have been a source of inspiration for many other churches. This volume is the most complete case study about the issue of 'gay marriages' in Churches to-date and it features the reflections of many regular worshippers at St Luke's. The vast majority of the people interviewed in the process expressed appreciation for the St Luke's pastoral work in favour of homosexual couples and it is important to note that only two parishioners expressed their dissent on the ground of Scriptural understanding [cf. Ibid. 159]. Two practical outcomes of Unheard Voices and Fr Heskins' incumbency were the composition of a Parish Policy about the subject and fixed texts for a Pastoral Liturgy for the blessing same gender partnerships. The experience of St Luke's has often been drawn into the Church debate during the past thirty years – its community ethos appearing even more 'liberal' than Issues on Human Sexuality or the Gloucester Report. However, its activism in favour of the LGBT community has been quietly expressed and seen as a by-product of the inclusion of homosexual couples in the life of the parish. This is almost the opposite experience to St Anne, Soho or St James, Piccadilly where the blessing of same gender partnerships seemed the natural step forward in the campaign for the religious and civil rights of the LGBT community. The inclusiveness of St Luke's seemed to be the only option available to this Christian community when confronted with the particular pastoral needs of Saxon and Rodney. Since then the parish has welcomed many more homosexual couples but it has kept a 'local' character in its ministry. This has evidenced the wide difference of opinions in the 'thinking and experience' [Ibid. 169] of the local parish and the quasi-fundamentalism in some branches of Church leadership. St Luke's inclusive celebration of diversity has been a source of healing for the gay community and it has challenged the views of those who had turned away from Christianity due to the fear of being rejected. Furthermore, the institution of fixed liturgies for the blessings of homosexual couples has sparked a debate about authority as well as possible theological understanding of committed, same gender partnerships.